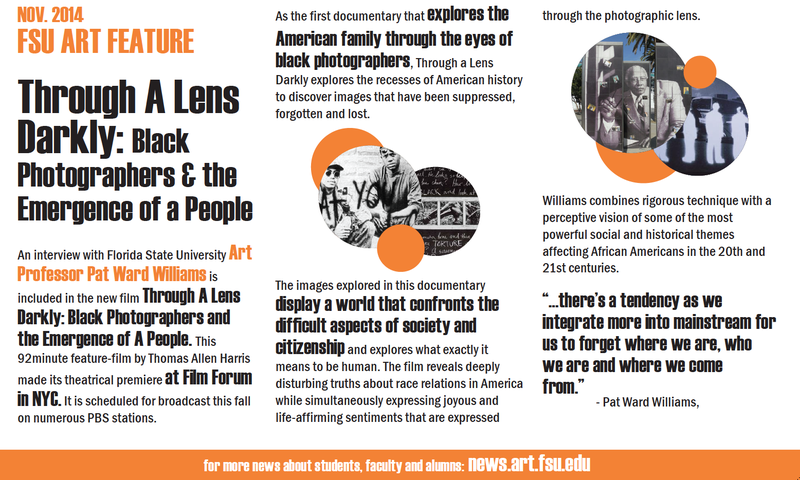 An interview with Florida State University Art Professor Pat Ward Williams is included in the new film Through A Lens Darkly: Black Photographer and the Emergence of A People. This 92 minute feature-film by Thomas Allen Harris made its theatrical premiere at Film Forum in NYC. It is scheduled for broadcast this fall on numerous PBS stations. As the first documentary that explores the American family through the eyes of black photographer,s Through a Lens Darkly explores the recesses of American history to discover images that have been suppressed, forgotten and lost. The images explored in this documentary display a world that confronts the difficult aspects of society and citizenship and explores what exactly it means to be human. The film reveals deeply disturbing truths about race relations in America while simultaneously expressing joyous and life-affirming sentiments that are expressed through the photographic lens. 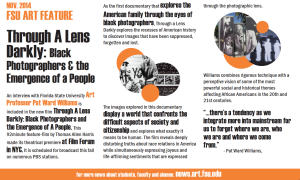 Williams combines rigorous technique with a perceptive vision of some of the most powerful social and historical themes affecting African Americans in the 20th and 21st centuries.